An Australian company leading the race in grid-friendly residential electric vehicle charging plans to take its revolutionary technology to the next level via investment partners such as those from the energy and electric vehicle industries. 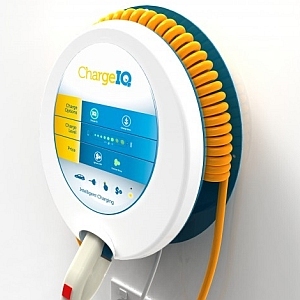 Developed by local technology company DiUS Computing, ChargeIQ is the world’s first ZigBee certified electric vehicle charger with the ability to communicate with smart meters. It features a web interface and a smartphone application that allows drivers to take advantage of flexible pricing to reduce the cost of their electric vehicle charging. A recent report by New York City-based Lux Research says that the market for EV infrastructure will rise significantly around the globe in the next decade with an expected increase in the market from $140 million in 2012 to $1.2 billion in 2020. DiUS Computing director and co-founder Joe Losinno explained how ChargeIQ works on a recent Sky News Australia’s Tech Report. “The technology connects wirelessly to your home electricity meter and we have a plug which plugs directly into the car. The plug is standardised by all the vehicle manufacturers… At the right time, when the price is the cheapest, according to the ChargeIQ technology, your car will start charging,” Losinno said. DiUS Computing’s ChargeIQ was the only electric vehicle charger used in the Victorian Department of Transport’s recently concluded Demand Response Load Control Electric Vehicle Trial, with one participant reporting that he was able to charge his vehicle for about $2 to $2.50 per 100 kilometres using the Australian developed charger. Losinno told the Tech Report that apart from the benefits to electric vehicle charging, the technology behind ChargeIQ had the potential to change the way householders consume electricity, and more importantly save money. ChargeIQ allows us to shift the charging or the use of the electricity to a time where it’s most convenient for the householder and at its cheapest on the market,” he said. “A future world will see electricity companies really offering incentives and ways for us to reduce our costs on the basis of shifting when we use electricity…ChargeIQ encompasses all that technology,” “Whilst the technology has been developed for electric vehicles, it can be applied to all appliances in the home, in particular any large high electricity drawing appliance,” he said. Losinno said after having spent three years developing the ChargeIQ technology, DiUS Computing was now looking to team-up with “heavy hitters” in the market to take its development to the rest of the world. “The technology has been in the in the field for over two years as part of the Victorian Department of Transport’s Electric Vehicle Trial and we are really looking to take the ChargeIQ to the rest of the world and to as many parts of the electric vehicle market as we can,” Losinno said.Check out the video of DiUS Computing Director Joe Losinno’s appearance on Sky News Australia’s Tech Report on Monday March 18, 2013.